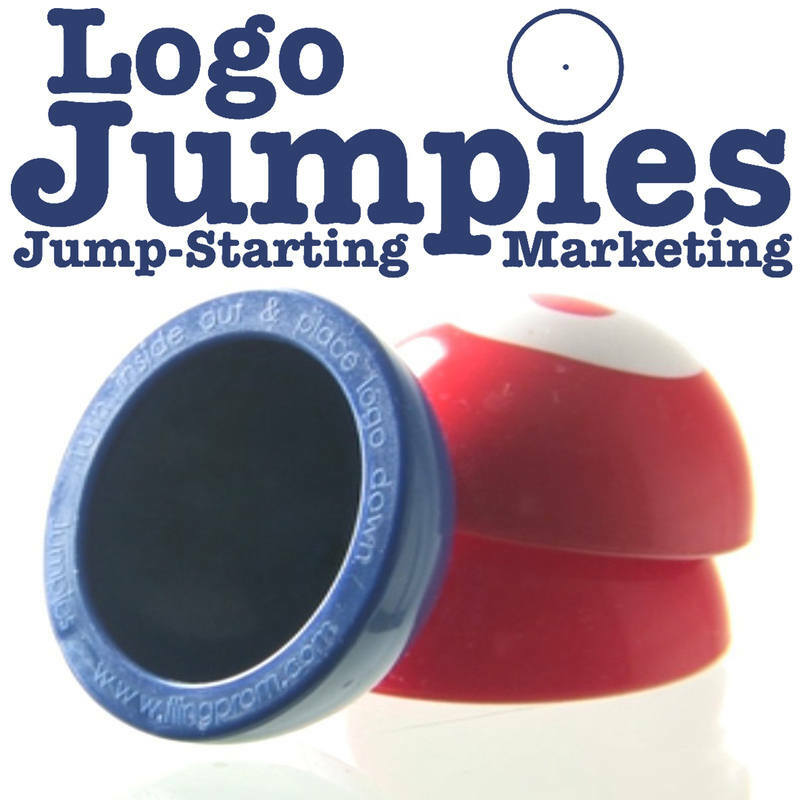 Logo Jumpies are a promotional product that can be printed with your own sales message or logo! Jumpies are 45mm, (1 ¾"), in diameter & look like half of a hollow rubber ball... But turn them inside out, place logo downwards onto a firm surface & watch them launch high into the air! Great trade show giveaway. Pop them on your booth to attract attention. Logo Jumpies are printed with special inks which provide a considerable resistance to wear & tear. Made in your choice of silicone colour & printed with a logo or message, this classic retro novelty promotion really is rocket science for your campaign! Plus our product has a unique built in feature that allows you to determine how long it takes to jump. If you invert them gently they will pop right away but applying a little extra sideways pressure when turning them inside out, gives a 'long fuse' that pops when least expected. Great for pranksters! Give-aways at shows & events, direct mail, brand exposure, product launches, website awareness & retail incentives. Delivery guide: 2 - 3 weeks from approval & payment. For orders of 3000 pcs - Pantone matching is available. Or choose from the colour chart below. Resolution: 300 dpi at full size. This product is supplied 250 pcs per polybag & 1000 pcs per outer carton. Bulk packed. Carton size: 46cm x 32cm x 30cm. Material: Premium grade Silicon - SIR 60. Toy Safety Tested to EN71 & ASTM with a 3 yrs + pass. Price includes one colour print, set up & express delivery. Promo-Bands.co.uk supply only the highest quality silicone wristbands that can be employed by individuals and organisations for any number of marketing uses. Our Charity customers use their custom printed silicone wristbands for fundraising & promoting awareness of important issues, whilst many clubs use their bands to confirm membership & create a sense of togetherness and inclusion. For business advertising, including B2B, bespoke silicone wristbands are a great way to raise brand awareness and connect with customers through social media platforms. Promo-Bands can integrate QR code technology into your custom printed silicone wristbands to link to any location on the web – a truly immersive experience for your customers! Religious organizations commonly use customized silicone wristbands in conjuction with campaigns & programs that focus on the local community – printed bands can be an excellent way to convey a message to an audience whilst giving them the sense that they have gotten something valuable for free – an age old marketing tactic. Our wristbands are extremely popular with schools for trips, school dinner systems, form group systems & more – enquire today! We also supply promotional keyrings that can be custom printed with your company’s contact details & name/logo – great for the automotive industry as you can attach one to your customers’ keys prior to returning the vehicle. Promo-Bands are also proudly the UK’s #1 supplier of personalized vape bands – great for promoting your store or juice brand! Customized Wristbands are the tried & tested method for face to face marketing – you won’t think twice after seeing our prices! Remember – Promo-Bands offer FREE CUSTOM PRINTED SILICONE WRISTBAND stock with every order – making us the best value-for-money printed silicone wristband supplier around!